A picture leaked from inside Tesla in the Netherlands, either from the Amsterdam service center or the Tilburg assembly plant, shows what could be a new vehicle and large shipment of Powerwall battery packs. The picture was posted to Reddit yesterday before being quickly removed. The original poster even deleted his account, but not before Electrek managed to get a copy. Before deleting his Reddit account, the poster said the picture was taken by a Tesla employee who couldn’t himself identify the vehicle at the bottom of the picture. 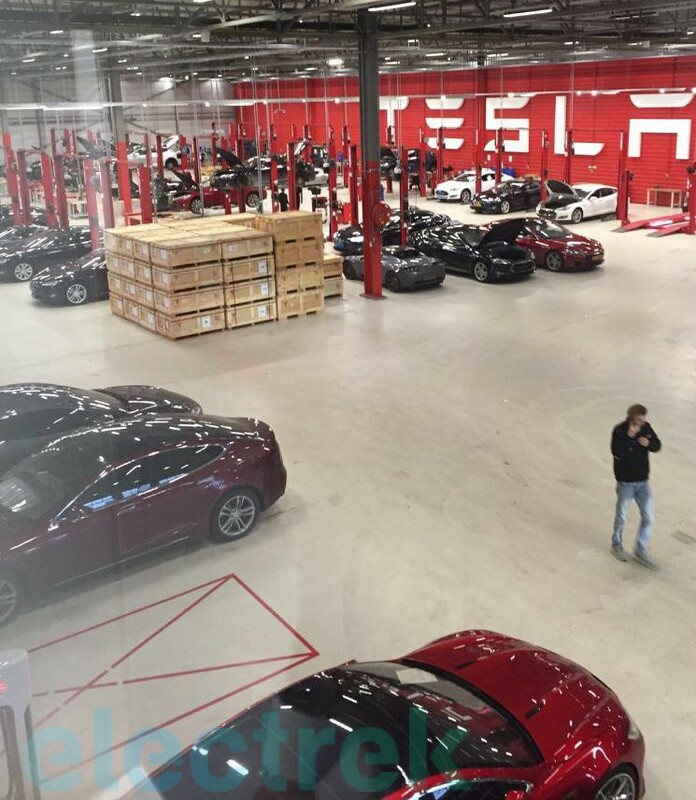 He also said that it was taken during a visit at Tesla’s new assembly factory in Tilburg, but based on the configuration of the lifts and the massive ‘Tesla’ logo on the background, it looks like might be Tesla’s Amsterdam service center, which is located about an hour and half drive away from the Tilburg plant. The picture features what appears to be a significant shipment of Powerwalls. The crates seem to match the custom crates we recently spotted and which you can see in details in our “How to install a Tesla Powerwall” article. The home battery packs being in the Netherlands makes sense since Tesla signed a deal with Eneco to bring the Tesla Powerwall to the Benelux (Belgium-Netherlands-Luxembourg) in “early 2016”. Also, the Vice President of Tesla Energy for Europe and Africa is based in the Netherlands. We count about 50 units in the shipment, which would be noteworthy on its own, but the picture becomes even more interesting when looking at the vehicle at the bottom. Before removing the picture, the originator of the leak claimed it was a “new model” from Tesla, which logically could only be the Model 3 or Y since those are only upcoming vehicles currently planned for Tesla’s lineup. We are not confident enough to say that it is a new model, but we can’t disprove it with certainty either. Here’s our analysis of the image. The hood does look significantly shorter on the leaked picture, but it could be explained by the angle and some distortion. Based on the reflection appearing on the bottom left corner of the original picture, it looks like it might have been taken through a window, which could accentuate the distortion. The angle and distortion could explain the shorter hood and steeper angle of the windshield, though it does appear significantly steeper on the leaked picture. The panoramic roof is also similar, if not identical to the Model S’, which further leads us to believe it could be a tuned-Model S.
Of course, it raises the question of “why would a Saleen-tuned Model S be in a Tesla service center in the Netherlands?” Only a very limited numbers of Model S’s are believed to have been tuned by Saleen, which is based in California, and Tesla has nothing to do with the tuning. Either Saleen or the car owner buy a Model S from Tesla and then Saleen adds its aftermarket parts. But yet I suppose that “why would a Model 3 prototype be in a Tesla service center in the Netherlands?” is just as valid of a question. We are still about two months away from the unveiling and at this point, prototypes would be expected to only be under-wrap at Tesla’s Design Studio in Hawthorne, California. A lot of questions for such a simple picture. What do you think? Let us know in the comment section below.